In order to retain your talent pool, the focus needs to be on building employee morale and allowing them to thrive in a culturally positive workplace. Find an individual who has a strong passion for the company culture to spread around to co-workers, and who has established a strong sense of trust within the company. These types of leaders can easily gain respect of their fellow employees to keep the engagement in daily activities and set standard goals for everyone to look forward to accomplishing. Besides free food in a lounge, offer your thoughts and appreciation to employees. They will appreciate the communication if they know it will help them improve in their position. Also, give them proper gratitude by saying ‘thank you.’ Give it a personal touch to show that you care by hand writing a note. Another sincere way of thanking someone is a small gift such as their favorite cupcake. Something anyone can look forward to! Currently with Generation Y starting to filter into the workplace, you have to adapt to a whole new lifestyle. A survey was conducted by Robert Half Technology and found that 54% of companies ban the use of social media by employees. With social media taking storm, employers need to adapt the usage into their structure. Setting ground rules is an important factor, but giving their employees the allowance to communicate in a high-technology driven era will benefit their morale. Have various options of training and continuing education programs available to help employees achieve goals and further develop themselves. Focus on recognition, promotions, or something for employees to look forward to. It reinforces the fact that you care about their current and future performance. How “The Office” Can Help. 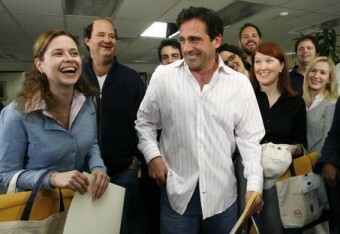 We’ve seen Michael Scott throw special occasion and birthday parties for his employees. He’s also started the tradition of the “Dundee Awards” each year focusing on his employees. Now, it usually all ends in disaster as Michael does something politically incorrect or stupid, but the focus here is on the intent. It gives a sense of value and satisfaction to the employee. It makes them feel like they belong, and that as an employer, you’re aware of what they have to offer. Even a charity team building event such as a walk can boost morale and show customers that you care for your staff, culture, and community. Michael Scott might also hold many office wide meetings every 5 minutes, but he listens and values his employees’ input on organizational issues. By keeping the communication open on a horizontal level, employee’s motivation will increase with their input in company decision-making. One example to note is Google’s system to keep reduce employee turnover. Sheryl Sandberg developed policies to help women in the workplace by offering child-care programs, and parking places for expectant women, according to Vogue magazine. These small changes in the company structure have led to successful outcomes for Google in their employee retention rate. Once an issue, the changes have been so successful that it has been implemented globally! As employees continue to focus on how they can positively impact the organization, we need to ensure the organization returns the favor. What are some of the ways we can return the favor?